Finding Joy in the Journey. . .: Pasta. . . Homemade is the only way to have it!
. . . that’s a statement, a fact, reality. Some question our motivation and logic, but I am here to tell you, once you have had fresh homemade pasta going back to the dehydrated version from the grocery store seems . . . Here I only discuss the basics of basics of how I make our pasta. . .
one that could easily pull you in and open your taste buds to a whole new delectable experience! There are other brands of pasta makers out there, but the Atlas Marcato is the one I decided to go with. . . I have NO regrets about my decision, and it works flawlessly! I have had it for over 20 years. As you ask, why on earth would I want to make my own pasta? I can buy it easily, and readily, there are a huge variety of shapes to choose from . . .
and it’s relatively inexpensive. . .
Let me tell you why we have chosen to in most cases make our own pasta . . . I also readily admit that the first pasta I made was Lasagna, easy, easy, easy! I am here to say, I’m not going back! Ask yourself. . . what is one of the biggest frustrations of store packaged lasagna noodles? Lasagna noodles rarely, if ever fit in YOUR pan quite right. Those said noodles are kind of a pain to cook. . . mine usually tend to stick together, they stick to the pan, they boil over. . .
simply put them in your pan and assemble! tasty Homemade noodles . . . I have concluded that my favorite blend is equal parts flour and semolina flour. when we made pasta for a Relief Society function we made our lasagna noodles for about 1/2 the cost of the no-bake variety and for about the same as the thick chewy variety out of a box, and that is using the Red Mill brand flour that tends to be much more expensive than purchasing flour in bulk. begin by combining the flours and pinch of salt, creating a volcano type mound directly on your countertop. with your fingers begin kneading and mixing it all together. The dough will probably be crumbly and you will need to add a little water to make it come together into a stiff but pliable dough that holds together. After some time and experience you will intuitively know when the dough is “just right”. I NEVER measure my water as the amount will be determined by the amount of humidity in the air on any particular day. Wrap the disk of dough in plastic wrap and let rest for a minimum of 30 minutes. set up your pasta machine, or if you do not have a pasta machine, you can easily use a rolling pin. . . but trust me, the pasta machine is honestly the best way to tackle this project, easy fast, and produces a perfectly even thickness sheet of dough. roll it through the pasta machine. plan on 4-6 passes on the first setting. Another advantage to having a pasta maker like this one is that the attachment is ready for pasta that will cut them into narrow strips that you would use in soup or for spaghetti. Then with a pizza cutter, cut your pasta to the desired size. whether it be for tortellini, Farfalle (bowtie), lasagna, chicken noodle soup, garganelli (otherwise known as penne), linguine or spaghetti. . . this is all there is to it. I used to have a pasta drying rack. It was presumably packed in a box, but I have yet been unable to find all of the pieces since moving. but in this tragedy, I have discovered that drying pasta on a “flour sack towel” works great! I have pretty much adopted this new method. A pasta drying rack is nice if doing long strips of linguine or spaghetti, or soup noodles (before cutting them) but most of the time especially the smaller or hand-shaped pasta the flour sack towels work perfectly. From this point I have launched into different shapes and styles of noodles. Again, I admit that shaping your own pasta like penne is not difficult, after investing in a couple of additional tools, but it is time consuming. For me, in a warped sort of way, I find it relaxing and enjoyable. Again, I want to emphasize that making your own pasta is well worth the time and effort, because, in all honesty, there isn’t much effort involved. . . besides, it undoubtedly beats anything you can purchase from the store . . . hands down. To keep with my goal of posts that are not too long I will spare you my tutorials for handmade/hand crafted pasta and provide you a couple of links that are EXCELLENT tutorials that you may begin exploring for yourself. . . 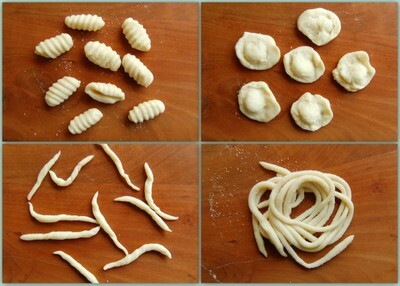 There are so many types of pasta shapes you can create! If you would like to learn more about shaping different pastas, as you can see there are multiple on-line tutorials both from blogs and you-tube that give wonderful instructions and ideas that you can access, much better tutorials, with much more experienced chefs than myself. With that statement, be forewarned that you may run into some you-tube tutorials that are done completely in ITALIAN! I found it amazing how much I was still able to learn by just watching. Toss the pasta into a large saucepan of boiling, salted water. (You will need about 4 quarts water and 3 tablespoons of salt for every pound of fresh pasta). 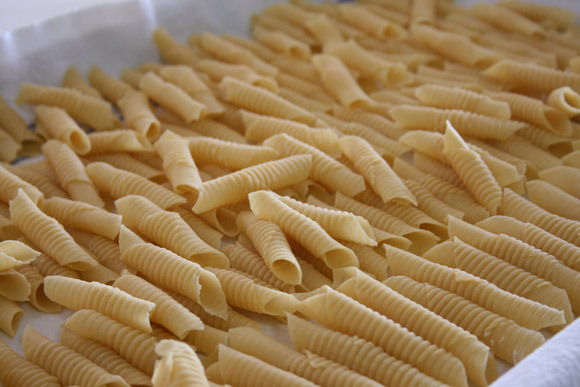 It is the large volume of water that will prevent the pasta from sticking together. Stir the pasta only once or twice—if you have enough water in the pan and you stir the pasta as it goes in, it shouldn’t stick together. DO NOT COVER the pot or the water WILL boil over. Quickly bring the pasta back to a rolling boil, stir, and boil until al dente, or firm to the bite, about 2 minutes. The pasta should not have a hard center or be soggy and floppy when done. Drain the pasta, holding back 2 to 3 tablespoons of the cooking water. Return the pasta to the pan (the dissolved starch in the water helps the sauce cling to the pasta). Serve the hot pasta immediately with your favorite sauce. Try a drizzle of olive oil or melted butter—cooked just to the point of taking on a slightly nutty, toasty brown tinge—and a smattering of fresh herbs constitutes a sauce when the pasta is as tender and tasty as this. I challenge you to have fun exploring the world of handmade pasta! none better on earth, period! It is totally delicious!